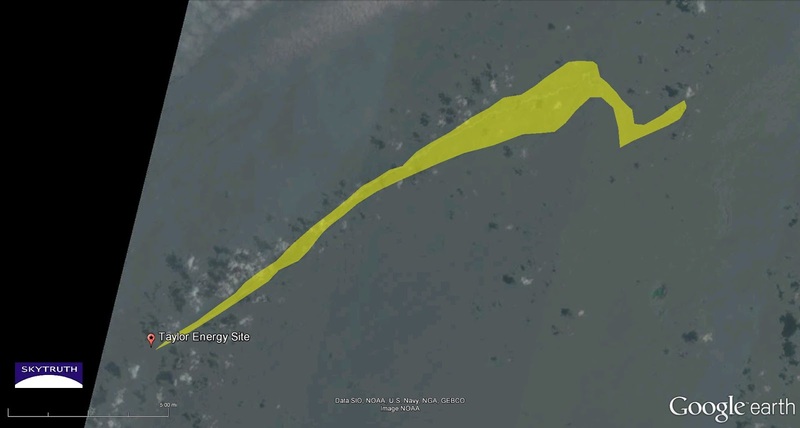 “This matter” is a chronic leak that’s been pouring crude oil continuously into the Gulf for almost 11 years, and shows no signs of tapering off. Taylor Energy has declared — apparently with no explanation or corroboration by independent experts — there is nothing they can do, that wouldn’t cause worse harm to the environment. Federal officials estimate the leak will continue for another 100 years, until the reservoir is tapped out. 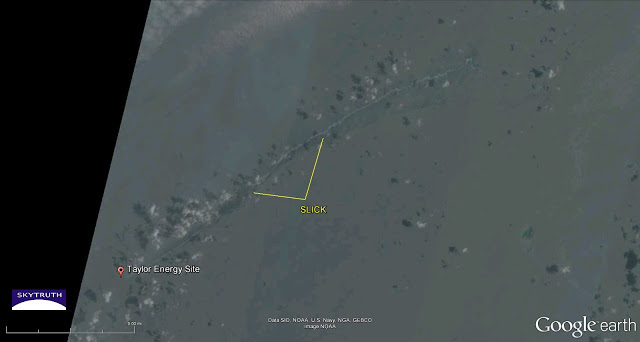 Here’s a satellite image of the Taylor site just a few miles off the coast of the Mississippi Delta, showing a 21-mile-long slick extending northeast from the location of the buried, leaking wells. It was shot from NASA’s EO-1 satellite on July 3, using the Advanced Land Imager (ALI) instrument. It has some remarkable detail: a thin sheen, slightly darker than the adjacent Gulf waters, surrounding a thin pale-blue streak that indicates oil thick enough to have the distinct reflectance signature characteristic of crude oil. We estimate the sheen is, on average, 1 micron (one millionth of a meter) thick. The pale-blue core is much thicker, perhaps millimeters thick. This is consistent with direct observations and sampling of the Taylor slick conducted by researchers from Florida State University last summer. 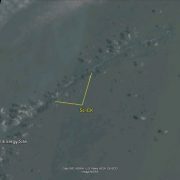 Detail from July 3, 2015 ALI satellite image of Taylor Energy site showing 21-mile-long slick trailing off to the northeast. Note the line of small, scattered cumulus clouds and their matching shadows that seems to follow the slick (water particles forming around aerosols caused by evaporating hydrocarbons?). Same as above, with our analysis of the slick extent (yellow overlay). Slick covers 30.7 square kilometers. Using our conservative rule of thumb — that a slick observable on satellite imagery is, on average, at least one micron thick — we calculate the 21-mile-long Taylor slick on July 3 represents at least 8,100 gallons of crude oil. And what did Taylor Energy report to the Coast Guard that same day? A slick 12 miles long containing 71 gallons. 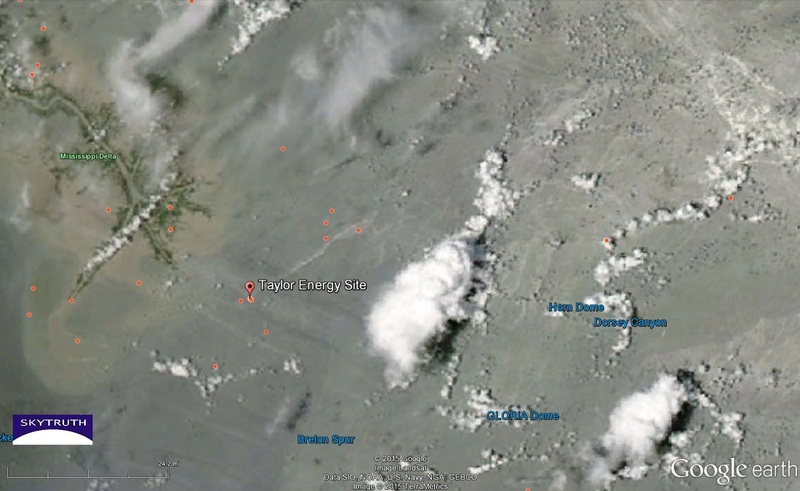 MODIS satellite image taken the same day (July 3, 2015). Sunglint patterns and various types of clouds make for a visually complicated image, but theTaylor slick appears as a pale line the same size, shape and orientation as in the more detailed ALI imagery above. Red dots indicate locations of oil spill reports submitted to the National Response Center (NRC) over the previous few weeks. The loose cluster of reports about 20 miles northeast of the Taylor Energy leak site suggests that those observers are sighting the far end of the Taylor slick.